Legacy Christian sophomore Jonathan Riddle (7) steals the ball away from Belmont’s Kasongo Lambert, in the first half of a boys high school soccer match on the Athletes in Action football field, in Xenia. Riddle scored both Legacy Christian goals in a 3-2 loss. Knights senior defender Josh Frueh (17) battles for control of the ball with Belmont’s Rashidi Ramasani, in the first half Oct. 6 on the Athletes in Action football field, in Xenia. 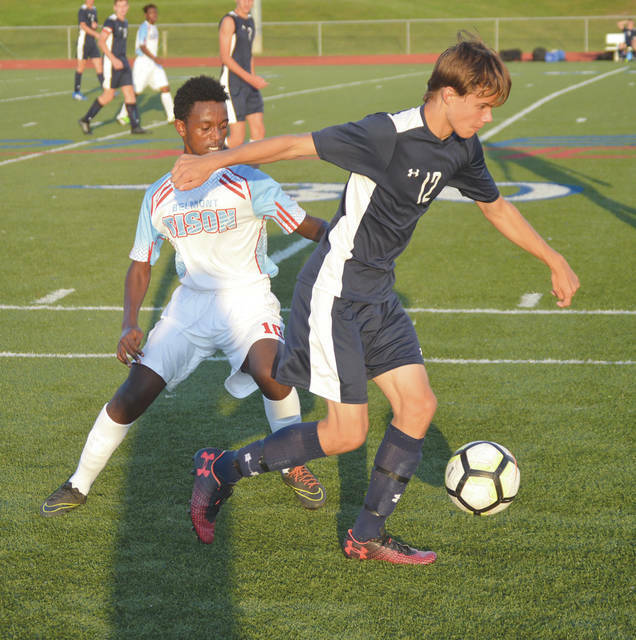 Junior Alan Brads drives past Belmont’s Ermias Tereke, in boys high school soccer first-half action Oct. 6 on the Athletes in Action football field in Xenia. 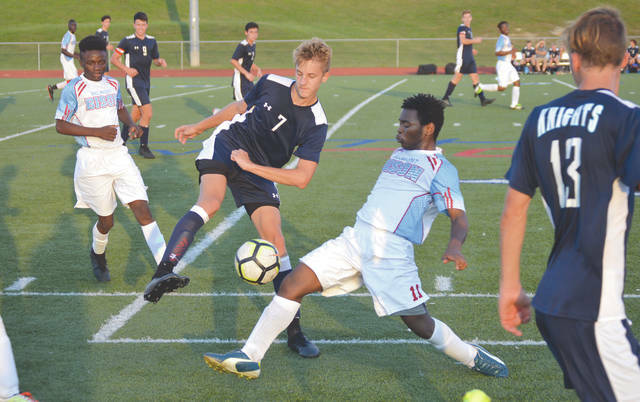 XENIA — While host Legacy Christian matched visiting Belmont’s intensity in the second half, the Knights just couldn’t rally from an early first-half deficit in a 3-2 loss, Monday, Oct. 6, on the Athletes in Action football field. Belmont (11-1-1) has a talented team of players comprised almost entirely of refugees. They bring an intensive international brand of the game that few Ohio teams ever see. The Bison’s intensity of play in the first half seemed to put Legacy Christian (8-5-1) on its collective heels. Senior Knights goalie Clint Brads was able to deflect away the first major Belmont shot attempt just inside of the 20-minute mark of the first half, but Bison co-captain Herman Chongwain was there to knock in the rebound from the left side for a 1-0 Belmont lead. The Bison’s Gerrard Mbangwa then crossed to Belmont teammate Izadine Daoud for a close-range goal with 16:42 left to play in the first half, for a 2-0 Belmont lead. Roughly four minutes later, Chongwain weaved his way around three Legacy Christian defenders before firing off a quick shot from the left side for the final Bison score of the half. Assistant coach Michael Anthony was coaching in place of his brother, head coach Nathan Anthony, who was away on a business trip. He said once the Knights played with the same intensity as Belmont, his team was back in the game. The new-found tempo began to turn the game’s momentum. Soon the Knights were taking on the role of attacker, with Belmont’s players shouting at each other on defense. Legacy’s Josh Stover almost got the scoring started for the Knights, just four minutes into the second half, when his chip shot from close range barely skipped high and wide left of the goal. Minutes later, Kevin McIntyre saw his shot sail wide right. Two minutes after that, Jonathan Riddle scored from about 10 yards out to make the score 3-1 in favor of the Bison. Belmont appeared to be getting unglued a bit committing a series of fouls, including a yellow card violation by one Belmont player. Riddle knocked in Legacy’s second goal with 13:55 remaining, but couldn’t manage the tying score. 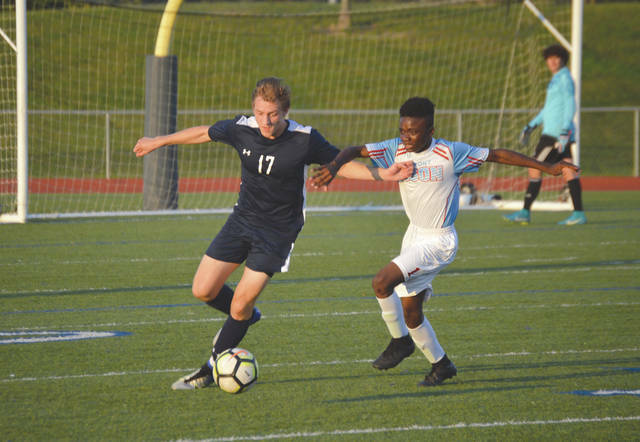 The Knights’ Josiah Entner had the last close call when his right-to-left shot got past the Bison keeper, but skipped just right of the far post with just over a minute left of the match. The Knights had won seven straight matches prior to Monday’s loss. Anthony said the win streak was a matter of the team coming together at the right time. The Knights are back in action Tuesday, Oct. 9 on the AIA football field when they’ll host Middletown Madison for a 7 p.m. match. Belmont returns to City League play at 5 p.m. on Tuesday when they’ll host Dunbar.